I don’t know about you, but when I see rain drizzling down and the temperatures falling, I feel the need to put a pot of soup on the stove! 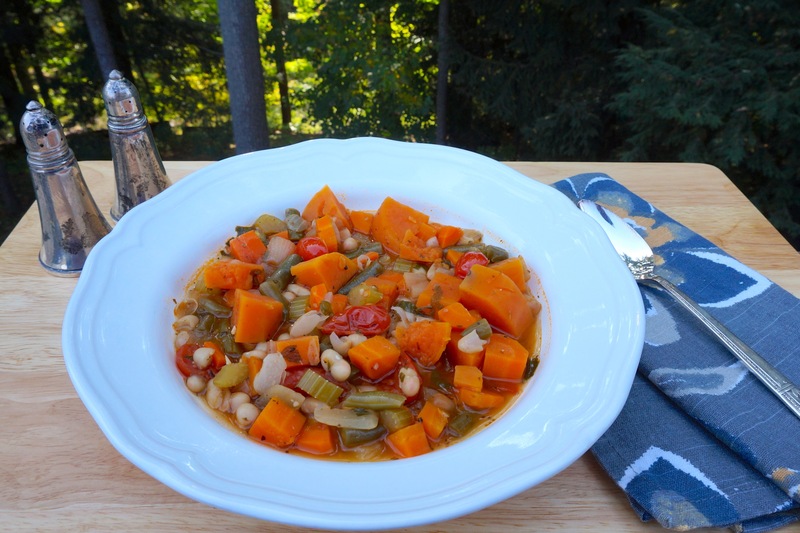 It might be a nice chili (like my Smoky Chipotle Chili) or a hearty vegetable soup like I want to share with you today. 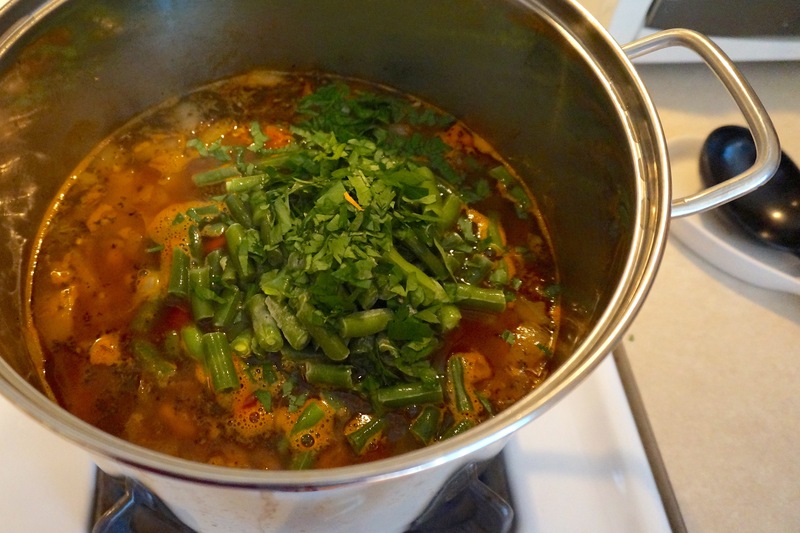 If you don’t have much time, a soup like this can be made relatively quickly on the stove. Or you can pull out your crockpot (slow cooker) and let it simmer all day while you do all those household chores that you’ve been meaning to do all week. 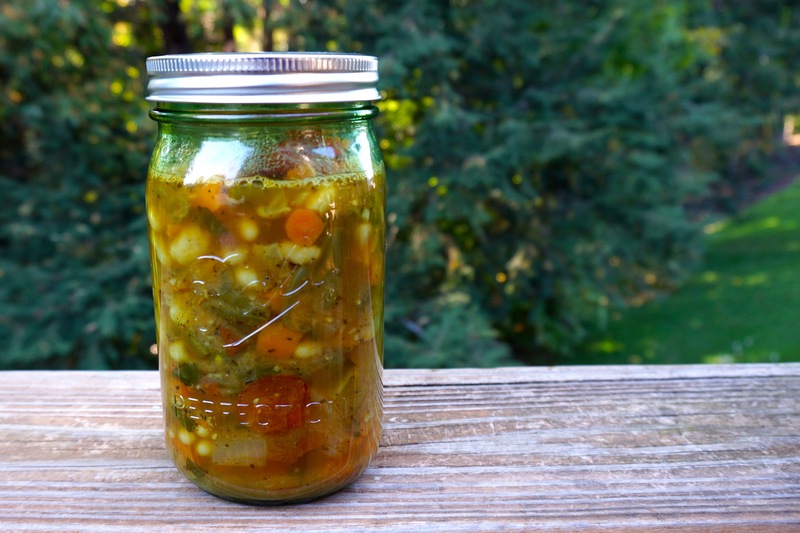 This vegetable soup can be made either way. The heartiness in our soup comes from the beans. Yes, I suppose you could do meat of some kind (chicken?) 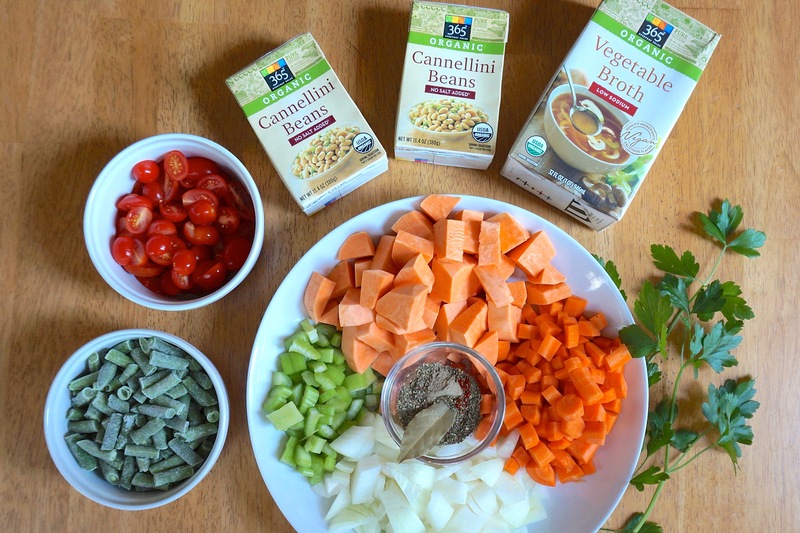 but I have gotten on vegan/vegetarian kicks and this soup fits the bill in all cases. You can really use any canned beans you have on hand but I also like the addition of frozen or fresh green beans (also a staple I like to keep in the freezer). Whatever you choose, this is a soup that can be eaten soon with some crusty bread. Or you can freeze or can for later. My mom always has some Ball jars on hand and puts hot soup in the jars, waits for it too cool and pop (which means it’s sealed), and then stores it in the fridge for up to 3 months. I found these lovely green Ball jars and use them to do just that! 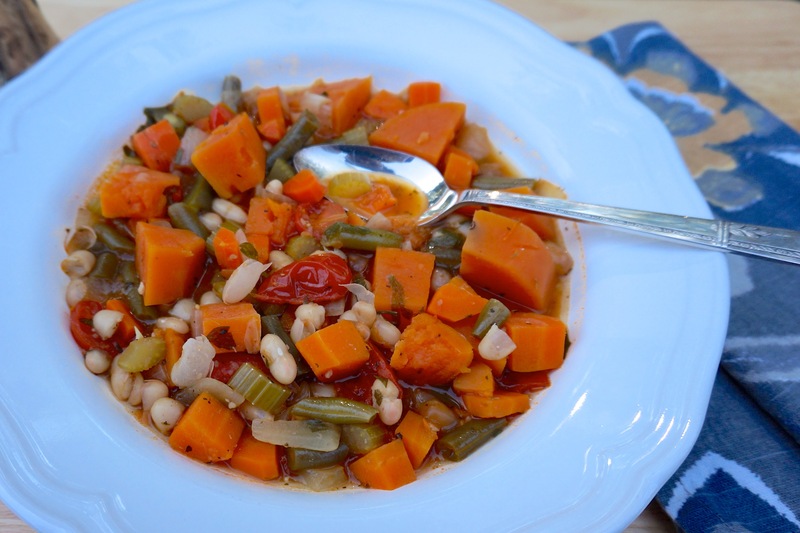 So fire up your stove, get your mirepoix going, and start making this soup. 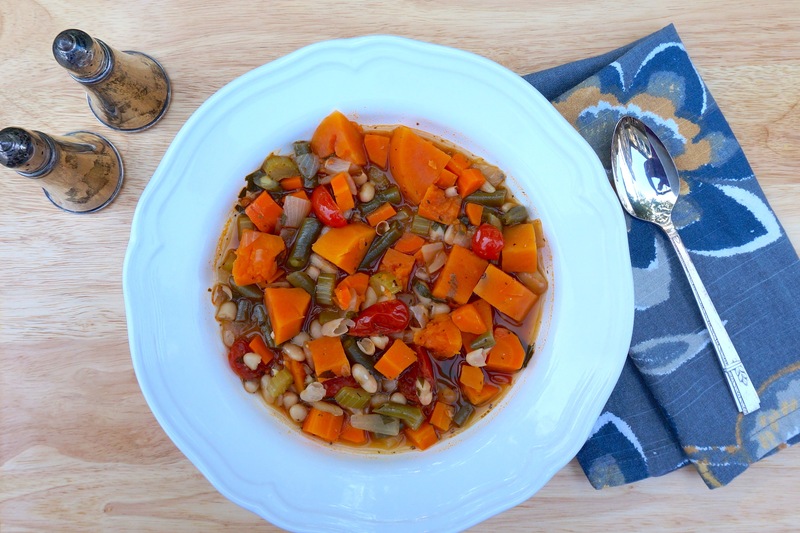 I promise you will be enjoying a hearty, vegan soup in no time that will warm you up and fill your belly. Bon Appetit! Heat 2 TB olive oil in a large stock pot on the stove. Add onion and garlic and sauté until translucent. Add carrots and celery and cook until lightly browned. Add sweet potatoes and cook one minute, stirring. Add broth and spices, bring to a boil, and then reduce and simmer for 20 minutes or until the potatoes are slightly tender. Add both beans and tomatoes. Stir in parsley. Simmer for 30 minutes. Salt to taste. Remove bay leaf. Serve or store in jars refrigerated. Slow cooker directions: Add all the above ingredients to the slow cooker, stir to combine, cover and cook on low 8-10 hours.